We're back in the swing of things, CSA-wise, which is good since we ate, ah, quite well, in Vermont and not always, ah, quite healthily.... The last package from Herrcastle Farm had four gigantic peaches that sat in a bowl on my kitchen table and perfumed the air with their peachy goodness. I looked at them yesterday and saw they were about to turn, so I decided (in my dreaming-I-was-a-Vermont- farmer's-wife way) to make peach cobbler with them. I've never made peach cobbler before, but it sounded like what you would make with fresh peaches and how hard could it be, eh? I turned to the usually-reliable "How To Cook Everything" but apparently Mark Bittman should have titled it "How To Cook Everything EXCEPT Peach Cobbler". Hrmph. It's the first time (admittedly in a million tries) he's let me down. oh. you should have called me. I could give you half a dozen cobbler recipes. sorry babe. 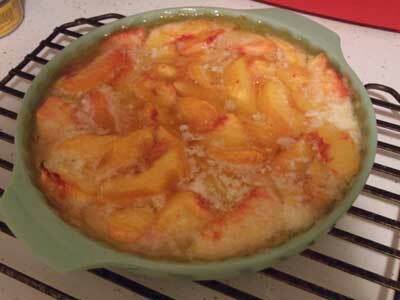 I made peach cobbler the other day and you are totally welcome to come eat it with me. I'm sorry that Paula Deen let you down. I know Alton did a whole show on cobblers. It looks good and peachy in the photo! Dice up the peaches, mix with a couple of tablespoons of sugar, 1/2 cup of dry white cake mix and put them in the bottom of a greased 8 X 8 baking dish. Put the rest of the dry cake mix on top. Cut up a stick of BUTTER and put it on top of the dry cake mix. Bake until golden. Eat while hot with vanilla ice cream. The fat free/calorie free part was a joke!!! Have my boy add this to our cookbook!